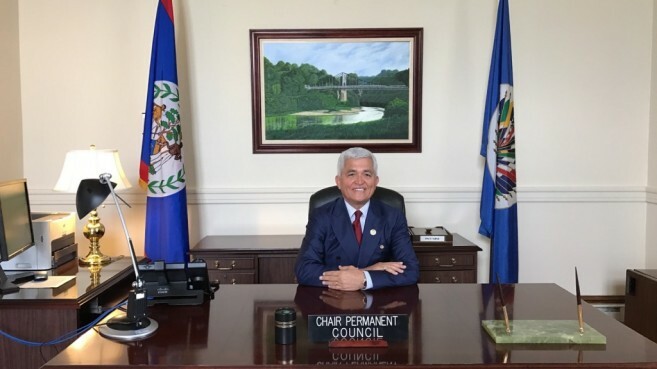 In Washington, DC, Belize’s Permanent Representative to the Organization of American States (OAS), Ambassador Patrick Andrews, assumed the Chair of the Permanent Council of the OAS on January, 12th. 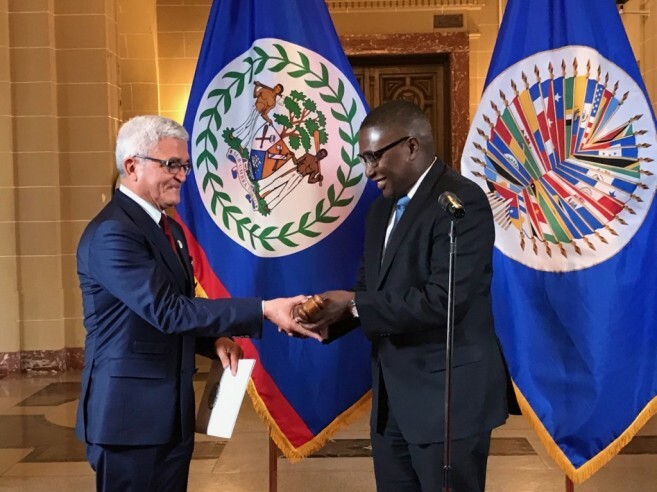 Not only is Andrews accredited to the OAS, but he is also Belize’s seventh Ambassador to the United States and the OAS. The OAS was established in 1948 for member states within the Americas to promote democracy, human rights, security, trade, and development. With 35 member countries, the OAS works to declare peace and justice, to promote solidarity, to strengthen collaboration, and to defend sovereignty, territorial integrity, and independence. Since becoming a member in 1991, Belize has played an active role in the OAS. Belize has even participated in various committees and specialized organizations to strengthen foreign policy and development agendas for the country. Upon receiving the chairmanship, Andrews addressed the country. “It is an honor and a privilege to be assuming the Chairmanship of the Permanent Council of the OAS on behalf of my country Belize. It comes at a very decisive time for both the hemisphere and the organization. It is undeniably an incredible opportunity for each Member State that assumes the Chairmanship to leave its mark in elevating this institution’s history and in contributing to its betterment and that of this great Hemisphere of the Americas,” said Andrews. As Andrews took over the portfolio from outgoing Chairman Selwin Charles Hart of Barbados, he thanked him for his contribution to the Council. “It is such that it would be careless of me not to congratulate Selwin Charles Hart for his stellar leadership and conduct during his tenure.” He also extended his great appreciation to the Ambassadors of Jamaica and Honduras for demonstrating great leadership and for their contributions. Belize last chaired the Permanent Council for three months in July 2008, where the period was used to focus on raising political awareness of the threats, challenges and opportunities inherent in climate change. Andrews stated that his new position will undoubtedly allow him to focus on issues relating to Belize. “There remain looming challenges on the horizon for our countries that will require the attention of the Permanent Council. We will not shirk our responsibility and commitment to raising the level of the dialogue of the Permanent Council, nor will we shy away from the tough issues; but in keeping in line with Belize’s role as the link between the two sub-regions of Central America and the Caribbean, we come to the seat of the chairmanship with our ever conciliatory spirit of good faith and with intentions to bridge the gaps where they exist,” said Andrews. Ambassador Andrews concluded by expressing his personal commitment to raising the level of political dialogue at the Permanent Council, in keeping with Belize’s role as the link between the two sub-regions of Central America and the Caribbean, as well as its conciliatory spirit of good faith. Since Andrews is pressing for tangible results on environmental, inclusive social and economic development goals, he has pledged to work to advance Sustainable Development for Economic Growth. Minister of Foreign Affairs Honorable Wilfred Elrington acknowledged how important Andrew’s chairmanship is to the country. 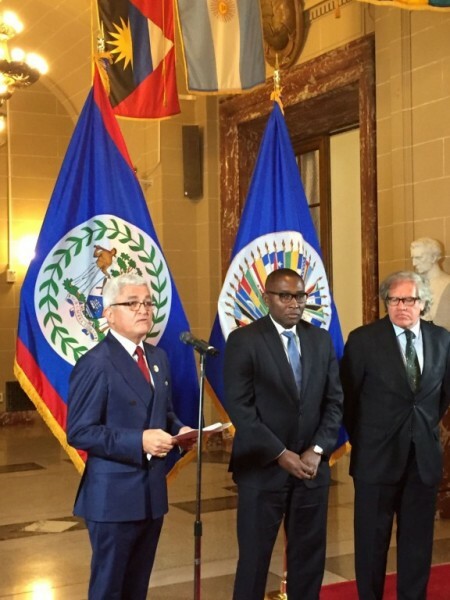 "The permanent council is where all the major decisions are made in relation to the OAS. The internal workings of the OAS is really the center of the organization and the presidency rotates every six months. Whenever there is any need for meetings, emergency meetings, discussion and the like, our Ambassador Andrews will be the person to convene the meetings. This is very important for us, because that's the organization that looks after the affairs in the Latin America and the Caribbean areas,” said Elrington. Belize will chair the Council until March 31, while the vice chair will be occupied by Honduras. The Council will also be preparing for the 47th OAS General Assembly to be held in Mexico in June. Born in Belize, Andrews attended college at Kansas State University in the US, and graduated in 1973 with a Bachelor of Science degree in economics. Spending much of his career as a banker at ScotiaBank, Andrews worked throughout the Caribbean and Canada before being named country manager for Belize in 2002. In 2007, he gained diplomatic service experience when he was named Canada’s honorary consul in Belize, and in 2014, he was honored by Queen Elizabeth II as a Member of the British Empire (MBE) for his services to community and banking.